Congratulations to the Alberta Chapter Governor-Elect, Peter G. Hamilton, MBBCh, FACP. Our new Governor-elect (GE) will complete a year of training as a Governor-elect and then will start his four-year term as Governor in the Spring of 2019. 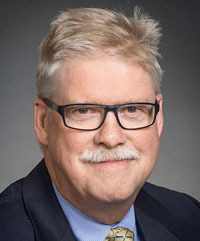 As Governor, Dr. Hamilton will serve as the official representative of the College for the Alberta Chapter, providing a link between members at the local level and ACP leadership. In the meantime, Dr. Hamilton will be working closely with Dr. Kassam (the current Governor) and College staff to learn about the College and his duties as Governor. To learn more about the new GE, read his bio below. Other Appointments/Activities: Dr. Hamilton has had multiple leadership roles from Residency Training Director to Assistant Postgraduate Dean and then Assistant Undergraduate Dean. He was elected twice to the Council of the College of Physicians and Surgeons of Alberta and served one term as Vice President. The Minister of Health appointed him as Vice Chairperson to the Out of Country Health Services Appeal Committee. He received the Prix d’Excellence from RCPSC for ”Commitment to the health and well-being of individuals and society through professional and personal integrity.” He is on the CCS Heart Failure Guidelines Committee and the Awards Committee of RCPSC. Areas of Professional Interest and Expertise: Dr. Hamilton has worked on a General Internal Medicine clinical teaching unit for more than two decades. He has mentored numerous medical students and residents. Although he trained in nephrology, his practice revolves around general internal medicine with a special interest in hypertension. He is the Co-Director of the Hypertension Clinic at the University of Alberta and has a designation as a Specialist in Hypertension by the American Society of Hypertension. He is an Editor of the textbook titled, “Drugs and Drugs - A Practical Guide to the Safe Use of Common Drugs in Adults”; now in its 4th Edition. He is the Chapter Editor-General Internal Medicine in the textbook “Approach to Internal Medicine”; 4th Edition.